This important and engrossing book brings to life the aesthetic power of a body of texts now institutionalized as reportage literature (baogao wenxue). It helps explain the pervasiveness, in other forms of cultural production, of certain tropes and assumptions of nationalist and progressive (leftist) discourse. Two key ideas structure Laughlin’s analysis of major texts of the genre. The first is that the literary construction of social space is the crucial element that distinguishes reportage, defined as “any deliberately literary non-fiction text that narrates or describes a current event, person or social phenomenon” (2), from other narrative forms. Thus, “characterization” in these texts is of “events, environments and collectives” rather than of individuals (28), and the book sets out to demonstrate how the literary construction of space enables collective forms of identification, rather than individualistic ones. This leads to the second major contention of the book: that the genre produces a narrative position at odds with the Enlightenment notion of the autonomous individual, imported by Westernized May Fourth intellectuals. Rather, it is argued that Chinese reportage creates a narrator who perceives historical events and persons as symbolic of abstract processes, and who does this perceiving “not as an individual or generalized human being but as one who primarily and collectively identifies with the Chinese nation” (39). This narrative position is the product of an indigenous (non-May Fourth) modernity. It draws on a literary tradition that stressed sincerity of expression and authenticity of experience, and on a cultural nationalism going back to the late Ming (exemplified by the travel writing of Xu Xiake). Accordingly, Laughlin divides his materials into subgenres defined in terms of the “literary realization of the setting in which the action takes place”: world cities and natural landscapes in travelogue; streets, the mise-en-scène of history, for public demonstrations; factoryscapes for labor reportage; battlefields and hospitals for war reportage, and the socialist work site, agricultural or industrial, for socialist reportage. These categories govern the book’s division into chapters, with two (hospitals and guerrilla landscapes) allocated for war correspondence. Literature contributes to the production of social space because it helps to shape people’s perceptions of their environment. Vital to the interpretation of this literary space is the body of the perceiver: “because the body in reportage is the vehicle through which the dynamic transformations of social space are perceived, and the features of the physical environment expressed in each work bear the mark of the author’s subjective reaction to each unfolding situation, the body itself becomes part of the continuum of social space” (31). The narrative practices thus engendered, through their immediacy and vividness, reinforce identification with collective and social forces, including the nation. Using this mode of analysis together with sustained close reading, Laughlin has tapped into a very rich seam, and provides readers with an often persuasive, at times moving, experience of the texts he explicates. The order of the chapters correlates with a narrative of Chinese history. Thus travel literature emerges in the late Qing as a form of knowledge and has as its subtext concern with the future of China. 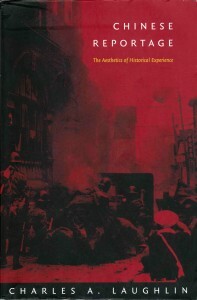 The chapter on demonstrations develops Marston Anderson’s discussion of the eruption of the crowd in realist literature as a theatricalization of the text’s message, and the chapter on labor reportage shows how investigation of the plight of the proletariat exposes the truth about society. With the chapters on war correspondence we suddenly have a key to understanding the appeal of many other fictional texts, for now we can better grasp how their tropes of landscape, suffering or longing had already been built up in reportage literature and become instantly recognizable within their communities of readers, which were larger at certain times than the readerships of fiction. One could hypothesize that the legacy of the intensely personal sense of China as “an extension or projection of oneself…one’s own body” (208) still circulates in popular culture and could account for the ease with which nationalist passion can be inflamed against any attempt to “break away” from the body politic. The chapter on post-1949 reportage yields the valuable insight that these texts, which often feature young men and women working closely together in exciting situations, “re-contain or displace their youthful energies from the dangerous realm of private intimacy to the ‘useful’ realm of economic or political construction.” (251). Party and proletariat become reified into abstractions, paralleling the “autonomous individual” of capitalism. For such intriguing insights alone (and there are many others), I would highly recommend the book for use on Chinese literature and culture courses, at undergraduate and graduate levels. But, like all major studies, this one is sure to provoke debate on a number of issues, some of which I will raise here. The first concerns the very boundaries of the genre under study. Laughlin’s work is based on the canon established by Chinese scholars in the 1980s, which concluded a process of institutionalization begun in the 1930s, when baogao wenxue was first promoted by the League of Left-wing Writers. Taking his story up to the mid-1960s, he does not consider the work of Liu Binyan on the grounds that Liu’s texie brought fundamental changes into the genre (27-28) and has in any case been exhaustively discussed by Rudolf Wagner (1992). Similarly, he also declines to consider other prominent “reform era” writers of reportage including Su Xiaokang, discussed in an important article by Zhang Yingjin (1993). Given the wealth of insights and the richness of the book we have in front of us, it is hard to complain. However, while the decision not to discuss post-Mao reportage is comprehensible, for reasons of space if nothing else, the decision not to discuss Liu at all is disappointing. Wagner’s masterly analysis shows that in the mid-1950s a series of struggles took place in China between proponents of two different models of personality: the “obedient” collectivist follower and the activist labor hero, often an intellectual who dared think independently (Wagner: 27-113). In literary terms it was articulated as a contest between eulogistic fiction and reportage pieces and the special report (texie), “a militant literary form” modelled on the Russian oçerk by Liu Binyan. These struggles were not, of course, only over education or literature, but reflected disagreements within the Communist Party and beyond on the broader issues of how to promote Chinese national development within a socialist framework, and what kind of subjectivities were needed (or could be tolerated) in this enterprise. This passage yields some suggestive parallels with Liu Binyan which would gainsay the claim that Liu abandoned the “entire legacy” of Chinese reportage. Elsewhere, Laughlin describes the work of Liu and other 1980s reportage writers as “non-literary,” claiming that they transformed it from “a literary genre into a communications medium …even when [they] made use of certain techniques such as fictionalization, composite characters and internal dialogue” (264, 265). It is unclear to me what is meant here by “communications medium,” and I am at a loss to understand how Liu’s work should be seen as any more un-literary than earlier works of reportage, like the labor reportage Laughlin cites, for example. Both combine an ethical stance with a rhetoric of unmasking (Laughlin: 118-124; Wagner: 253-254), making the life of the common people the touchstone of truth and reality in society. Liu Binyan’s comment in 1992 that “reportage literature is not literature” (Laughlin: 304 n. 1) does, of course, give pause. But here we need to know what “literature” signifies in Liu’s discourse at the time. Could he have intended to oppose the claim of truthfulness-to-facts in his writing to the experiments with “pure literature” (chun wenxue), narrative indeterminacy or interiority his university audience would have been familiar with? In any case, a writer’s comment on his own work need not be the last word in these matters, particularly on an issue such as genre. In contrast, Chen Xiaomei (1985) shows that after Liu’s 1979 piece “Ren yao zhi jian” attracted readers with its dialogical functioning as against the monological discourse of the party-state, 1980s reportage became more popular than the short story or drama and its “claim to historicity” gave it the “full canonical status of a literary genre” (94). Laughlin has done us a great service in showing how that monological discourse was being textually produced before the Cultural Revolution, and he would not have harmed his sensitive analysis of those texts had he also discussed the competing discourses that were being put forward in China at the time. I find this disturbing, not because I would deny the historicity and cultural specificity of notions of the individual, but for the way it telescopes together the logically distinct ideas of the self-sufficient individual and individual rights, and categorizes them both, from the perspective of the present (“are not universal truths”), as alien. Perhaps the intention is to counter Euro-American claims to moral superiority, made in the context of globalized economic competition. But too much is left out of the equation. The early twentieth century is a century away, and it was then that China rid itself of the imperial system which was the lynchpin of the unequal distribution of rights between society and individual. (On the hierarchical nature of Chinese society and the question of rights, see Yu 2000.) The social practices of Chinese modernity themselves, not just the rhetoric of Westernized intellectuals, contributed to the construction of (more equal) republican citizens. For example, as Goldstein (2003) has shown in a recent study of changes in the use of space in early twentieth century theater, Qing teahouses were organized spatially to reflect social differences, and commoners, officials, and actors were restricted to separate areas within them. But in the Republican playhouse, in step with the principles of nationhood, the members of the audience were supposed to be treated with equal respect in a universal public space. Are we to discount these kinds of historical experience? Also worth considering, in this context, is the fact that reportage literature itself was an international, leftist cultural form, yet presumably was not experienced as so alien. Laughlin is explicit that a “radical moral iconoclasm, formed to a large extent by Leninism, is particularly prevalent in reportage and is closely related to the construction of the collective subjectivity that characterizes the development of the genre” (89). In the final chapter, using a 1931 story by Rou Shi as an example, Laughlin argues convincingly that it prefigured the utopian rhetoric of CCP literary production. It demonstrated that “[l]ater developments were not aberrations or distortions of the spirit of reportage but an integral part of the genre at the point of its importation into China as part of the cultural package of the international proletarian literary movement” (224). I would argue that the acceptance and practice of this cultural package owed much to May Fourth discourses of nationalism and selfhood, exemplified (to make a gross simplification) by Hu Shi’s da wo (greater self, or society), and xiao wo (small self). This formulation could in turn be related to orthodox Confucian notions about the relation between man and society (Denton: 1998). There is little discussion in the book about possible resonances between reportage and traditional aesthetics. The chapter on guerrilla warfare provides a fascinating look at a work by the CCP military commander Chen Yi, entitled “Springtime in Jiangnan during the War of Resistance.” Laughlin sensitively describes it as “renewing the covenant of intimacy” with the Chinese landscape, known to readers through the literati tradition. Chen Yi often ironically highlighted the difference between the cold, wet Jiangnan he experienced and the lushness of its textual poetic image. Perhaps the evocativeness of his essay has something to do with the fact that he was himself a poet of shi and ci. Traditional aesthetics do surface intriguingly, in a discussion of Hu Feng. Concluding the book, Laughlin reiterates that reportage, by placing subjectivity outside the individual and within the event and the social space within which it transpires, aspires to communicate to readers the form of collective consciousness appropriate to the historical moment. He draws on an article by Hu Feng to illustrate this aesthetic of collective consciousness, arguing that far from being individualistic, Hu’s emphasis on the “subjective fighting spirit” was an attempt to promote a new and unfamiliar type of revolutionary consciousness (268). Thus, Hu insisted that emotion is supposed to arise from the object of description and not its subject: “’Without emotions (qingxu), the author will not be able to penetrate within the object; without emotions the author will be even less able to express the object he wants to communicate, whether on the level of image, sensations, or of the mixture of subjective and objective….but the emotion we want must be presented as an attribute of the object itself, and indeed must be something radiated ‘simultaneously with the object’” (268-269). Such a position would have been impossible for someone who saw the individual as “an island of consciousness set in opposition to society and the objective world.” Indeed, it would. However, another possibility to explore is that Hu referred to qingxu in keeping with “the dualistic function of many Chinese critical terms i.e. their applicability both to some quality in the world, and the same quality in the mind of the perceiver” (Chaves: 345). Another model of selfhood is implied here, neither reified into Enlightenment autonomy, nor totally and radically collectivist. Charles Laughlin has given us an intensely engaging book that opens up many interesting perspectives. My questions about some of its premises do not detract from its importance or usefulness as a major contribution to the field of modern Chinese literary studies. I recommend it most highly. Chaves, Jonathan. 1983. “The Panoply of Images: A Reconsideration of the Literary Theory of the Kung-an School.” In Theories of the Arts in China. Ed. Susan Bush and Christian Murck. Princeton: Princeton University Press. Chen, Xiaomei. 1985. “Genre, Convention and Society: A Reception Study of Chinese Reportage.” Yearbook of Comparative and General Literature 34: 85-100. Denton, Kirk. 1998. The Problematic of Self in Modern Chinese Literature: Hu Feng and Lu Ling. Stanford: Stanford University Press. Goldstein, Joshua. 1993. “From Teahouse to Playhouse: Theatres as Social Texts in Early-Twentieth Century China.” Journal of Asian Studies62:3 (August) 753-780. Wagner, Rudolf G. 1992. Inside a Service Trade: Studies in Contemporary Chinese Prose. Cambridge: Harvard University Press. Zhang, Yingjin, 1993. “Narrative, Ideology, Subjectivity: Defining a Subversive Discourse in Chinese Reportage.” In Liu Kang and Xiaobing Tang, eds. Politics, Ideology and Literary Discourse in Modern China: Theoretical Interventions and Cultural Critique. Durham: Duke University Press, 301-304.